New Delhi: The Metro Rail News team under the ownership of Symbroj Media Pvt. 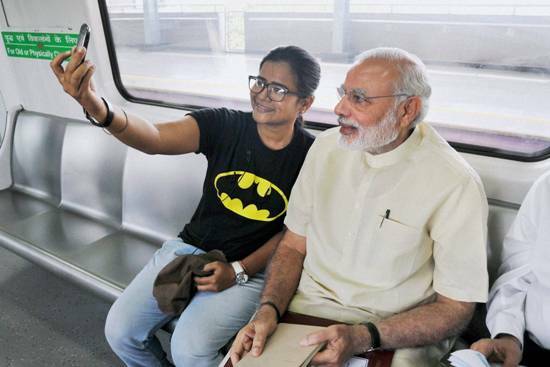 Ltd. is organising a Selfie Contest with the title “Selfie in Metro” to encourage and create a gift winning opportunities to Metro Rail Guys, commuters and metro lovers. The contest will run from 20 September 2016 to 20 October 2016. 1. Organiser & Eligibility: “Selfie with Metro Contest” is organised by Metro Rail News team under Symbroj Media Pvt. Ltd. This Contest are open to anyone who is eighteen (18) years or older at the time of entry. 2. Duration: This Contest will run from 20 September 2016 to 20 October 2016. The Organiser reserves the right to amend the Contest Period at any time. All entries received outside the Contest Period will be disqualified. c) Participants may then submit a selfie of themselves. The photo must be submitted via a wall post comment that ends with #MetroRailNews the wall post. d) All approved/qualified entries submitted for this Contest, upon moderation by the Organiser, will be saved into a Photo Album on the Metro Rail News Facebook Page during the Contest Period. e) Winners will be selected by a panel of judges based on creativity, originality and relevancy of the photos submitted to the Contest theme. (i) Participants agree to abide by the Contest Rules & Regulations. (ii) The participants is hereby reminded not to irresponsibly or unnecessarily, intentionally or unintentionally, manipulate, exploit or harm the metro authority for the purposes of this contest, and shall take full responsibility of any undesired incidents thereof. In any event, the Organiser reserves the absolute right to disqualify any entries viewed or observed to contain any such elements. (iii) In the event of duplicate entries from the same participant, the submitted entry which is most recent will be treated as a valid entry. In the event of duplicate submissions from different participants, the first submitted entry will be treated as a valid entry based on the time of receipt. (iv) In order to participate in this Contest, each entry submitted must complete all the steps in the Contest. Any incomplete entries will be automatically disqualified. (v) Only the winners will be notified via Facebook message/Facebook wall post. The Organiser will not be held responsible should there be any error, delay or defect in notification via the Facebook messages and/or Facebook wall post to the participants of the winners. a) The selected winners will be announced via a wall post on the Metro Rail News Facebook Page. Winners will also receive either a private message or a tag on the wall post posted on the Metro rail News by the Organiser. Selected winners are required to respond to the Organiser based on the instruction provided within Seven days from date of notification, failing which, the next best entry will be selected as the winner. The Organiser shall not be held liable in the event the winner(s) cannot be contacted for whatever reasons after at least three attempts by the Organiser or its agents to contact the winners. All prizes must be claimed within one month from the date of notification. All unclaimed prizes will be forfeited. The Organiser will not be held liable in the event of non-receipt or delayed delivery of the postal notification to the winner[s]. b) The selected winners are required to complete the verification process by sending an email to [email protected] containing their Winner number, E-mail Address, Mobile Number, Residential (Postal) Address, and agree to the Contest Rules & Regulations, and providing consent pursuant to the Personal Data Protection Notice. c) Participants are only entitled to win one prize throughout the entire Contest period. d) The Organiser shall reserve the right at its absolute discretion to substitute any of the prizes with that of similar value, at any time without prior notice. The values of the prizes are correct at the time of printing. All prizes are given on an “as is” basis and are not exchangeable for cash, credit, other items or voucher, in part or in full. e) All winners must abide by the terms and conditions of the parties arranging and/or providing for the prizes and the terms and conditions attached to the prizes, if any. a) By submitting your entries for this Contest, all participants agree and acknowledge that all intellectual property rights shall belong to the Organiser. The Organiser shall have the exclusive right to use, edit, modify and publish the entry submitted by all the participants, publish the names of the participants, in any way it deems fit for any advertising, trade, promotional purpose and for any other reason whatsoever, without any further notice to the participants and the participants shall not claim ownership or any payment or compensation on the materials. For the avoidance of doubt, the submissions will not be edited for judging purposes. The Organiser will be using participants’ submission photos to be featured in Metro Rail News Facebook wall posts. b) The Organiser reserves the right to modify, suspend or cancel this Contest in the event that it becomes not capable of running as planned, technically interfered or corrupted, including but not limited to infection by computer virus, bugs, tampering, unauthorised intervention, fraud, technical failures, or any other causes beyond the control of the Organiser, despite the best efforts of the Organiser. c) The Organiser reserves the right, in its sole discretion, to disqualify any participant that is found or suspected of tampering with the Contest submission process, the operation of this Contest. The Organiser reserves the right to terminate the submission of any Facebook user of any person who it reasonably suspects has violated or infringed any of the segeneral terms and conditions and the Organiser reserves the right to pursue legal action against any individual it believes has undertaken fraudulent activities or other activities harmful to this online Contest. b) The Organiser, in its sole discretion, reserves the right to modify this Rules & Regulations without any prior notice, if required for the smooth running of the Contest. c) This Rules & Regulations are prepared in English only. d) The Judges’ decisions are final and no correspondence thereon will be entertained. e) By participating in this Contest, participants agree to be boundby this Contest Rules & Regulations, and the decisions of the Organiser.